I thought a good way to start off my long awaited entry into the world of blogging would be to explain why I chose to call my blog La Dolfina. a strange looking creature that I couldn't quite identify. In fact, for many years, my husband and I debated about whether it was a dolphin or a koi fish. I'd always maintain that it was a sort of mythical dolphin and he'd insist I was wrong. Anxious to put an end to our argument, I went to the internet to find out once and for all what this exotic fish was called. As it turned out, I was right! It was, in fact, a mythical dolphin with a long and storied history. "Just as the Lion is the king of beasts, the Eagle the king of birds, so in similar heraldic sense the Dolphin is the king of fishes." My obsession with these mythical dolphins grew and continued to capture my imagination. I would delight each time I discovered a new one to add to my growing collection. While making my garage sale rounds this summer, I happened upon a sale with an amazing collection of nautical items. Many of them came off an old coast guard ship. I could barely contain my excitement over the scores I made that day! 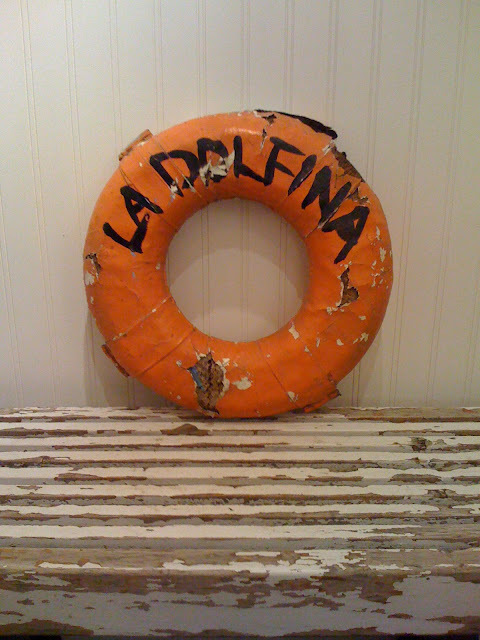 One of the items was a small, old, cork life preserver painted orange with the words "LA DOLFINA" scrawled on it. I packed it away with the rest of my treasures into the back of my Volvo station wagon, and made one last stop at my favorite consignment store before calling it a day. I emerged victorious, clutching in my hand an old brass compote with a pair of mythical dolphins at its base. Upon arriving home, I began the ritual of unloading everything onto my driveway to admire and clean my new found treasures. My next door neighbor stopped by to check out my haul for the day. She spied the little orange life preserver and declared, "Terri! You should name your shop LA DOLFINA!" I immediately knew she was right! Looking back on the day I realized that it was not a coincidence that the name La Dolfina was not only spelled out for me, but given to me in form as well. I insisted my husband and son call me La Dolfina so I could try it on for size. It fit perfectly! I was convinced that I had found the perfect name, or rather, the perfect name had found me. It symbolizes my lifelong fascination with the sea and all its glorious treasures. It's displayed in vignettes throughout my home and has a special place in my heart. I'm so excited about my blog and I hope you will join me as I venture into the blogosphere! Good luck tomorrow at the flea and I will see you there space T7. Got the car gassed up, cash in hand, sunscreen ready to go, alarm set, now it's time to call it a day. Can hardly wait to see you again.